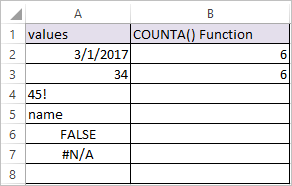 COUNTA Function in Excel returns the count of non-blanks cell. 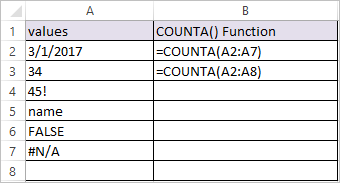 In other words, COUNTA Function count the cells only if the cells have some values in it. The numbers and the date 03/01/2017 , The text value “name”, the logical value FALSE, TRUE and the error value #N/A, #VAL! are counted by the COUNTA function. The empty cells are not counted by the COUNTA function.